Collard greens, garlic, and red pepper flakes are tossed with browned turkey Italian sausage and pasta in this easy recipe for Pasta with Italian Sausage and Collard Greens. If you haven’t warmed up to collards, use any type of greens you’d like! Use the Diet-Type Index to find more recipes like this one. Click here to PIN Pasta with Italian Sausage and Collard Greens! 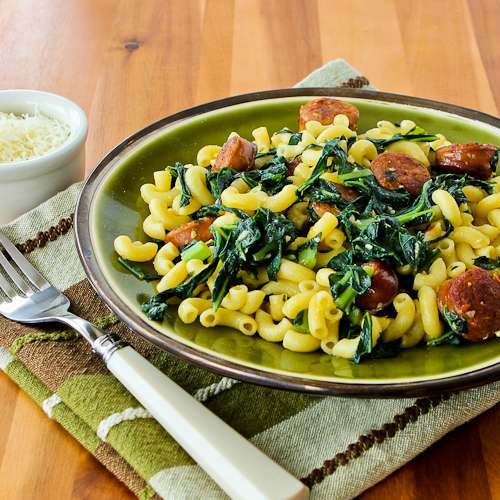 This easy and delicious recipe for Pasta with Italian Sausage and Collard Greens was adapted from one of my most-used cookbooks, Mark Bittman’s The Best Recipes in the World. I’ve been cooking from this book since I first discovered it in 2006, and haven’t found a bad recipe yet. My version of this classic dish uses nutritious dark green collard greens, and I’m also using turkey Italian sausage, since it’s lower in fat and turkey is one of the Superfoods. I also used more collards and sausage in proportion to the macaroni to make this more nutritious. When I first made Hopping John Soup I discovered how much I liked collard greens, and the only thing I might change when I make this again is to double the collard greens for even more veggie goodness. You could also use less pasta and more sausage and collards if you want to make this a lower-carb recipe. If you’re starting with uncooked turkey Italian sausage, first simmer them in a small amount of water until the sausage is barely cooked and firm. While sausage cooks, cut the collards into ribbons and wash in a salad spinner (or in the sink.) Cook the collards for about 5 minutes in a pot of boiling water. Slice the cooked sausage into rounds. Brown sausage in a generous amount of olive oil. (The oil stays in the pan to saute the garlic, red pepper flakes, and greens, and it seasons the pasta, so don’t cut it down.) When the collards have cooked 5 minutes, remove them from the water, add salt, bring back to a boil, and add the the macaroni (or other pasta shape) to the same water and cook until it’s barely al dente. Then drain well, saving about 1/2 cup of the pasta cooking water. Remove the browned sausage and add the garlic and red pepper flakes to the olive oil and cook for a couple of minutes. Then add the collard greens and cook until they’re heated through, about 2 minutes more. Add the sausage and pasta into the pan with barely enough pasta cooking water to moisten the dish and cook just until the pasta and sausage are heated. Serve hot, with freshly grated Parmesan cheese to pass at the table. Collard greens, garlic, and red pepper flakes are tossed with browned turkey Italian sausage and pasta in this easy recipe. Bring small pot of water to boil, add sausage and cook at low simmer 10 minutes. Let sausage cool and slice. Bring large pot of water to a boil, add sliced collards and boil 5-7 minutes, until tender but still bright green. Remove collards from water and drain, keeping water in the pot and bringing it back to a boil. When water comes to a boil, add pasta and a generous amount of salt and cook 9-10 minutes, until done but still quite al dente. Drain pasta, reserving about 1/2 cup of cooking liquid. While pasta cooks, in large skillet, heat 2 T olive oil. Add sliced sausage and brown until well browned on both sides. Add remaining T olive oil (if desired, I didn’t need it) and garlic (and red pepper if using) and cook 2 minutes, scraping bottom of pan to get browned sausage bits. Add collards and saute 2 minutes, then add sausage, pasta, and enough cooking liquid to moisten dish, and cook 2 minutes more or until the pasta and sausage are heated through. Recipe adapted from The Best Recipes in the World. This recipe was first posted for an event called ARF/5-A-Day at Sweetnicks. Erin Cooks made this recipe and has a great photo of the finished dish. I’m absolutely going to have to try this recipe! I love this book and have only had success from it so far. I love collards and have a recipe I’ve developed on my site. Erin, so glad you liked it. I have a neighbor who loves this dish! I think collard greens are so delicious too, that’s what made me try the recipe in the first place. I made this for dinner last night and it was awesome! I received a huge bunch of collard greens in my weekly csa box and I had no idea what I was going to do with them, but then I found your recipe. Of course I didn’t use low carb pasta, but I really enjoyed the fact that the dish took on such great flavors from cooking the turkey sausage and collard greens in the same pot as the pasta. The red pepper flakes and garlic were a fabulous addition as well. Thank you for making us aware of this recipe! kalyn…do you have an email? i’m disturbed by something…and i gotta let it out! well, instead of posting it just email me monasapple at gmail. I am so getting that book. All the recipes you’re making from it are inspiring me. I walked by it the other day in Barnes and totally thought of you..
Looks delicious. I want to mention that I really like the mushrooms in your mast too. Aren’t mushrooms the greatest? Brendon at Something in Season is also a fan of this cookbook, Kalyn. I’ll have to look it up at the bookstore next trip. Fran, this book is amazing. If you want to see what recipes I’ve tried, you could find them by using the search box on my site and typing in “The Best Recipes in the World”. I have loved everything I’ve made from it. This looks really delicious. I had just bought Mark Bittman’s book and had great plans when I broke my knee. Have really enjoyed reading it & getting ideas. Will put it on my list of “to try soon”. Thanks.